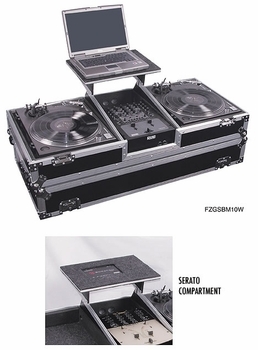 Odyssey FZGSBM10W DJ Coffin w/ Wheels DJParts - All Variety of Parts that DJ Needs. Our Glide Style Coffins hold two turntables in battle position, one mixer and a laptop. It has a convenient compartment specially designed to house a Serato interface built right into the gliding laptop platform. Other features include rugged built-in wheels, heavy duty spring loaded latches, stackable ball corners, and front access panels. Cabling is clean and easy through convenient access ports throughout. Mixer well holds mixers with a width from 8.75" to 10.25", depth up to 14" and 3.25" tall. Width Height Depth 45.25" 12.5" 21.5"
Width Height Depth 45.75" 13.5" 22.25"